A Delicate Blend from Greece. Aromas of green fruit, green grass, tomato and notes of green almond. Taste exhibits medium fruitness, green grass, some sweetness, some bitterness, light pungency and notes of artichoke, with exceptional harmony, a high complexity and a high persistence. An extra ordinary, limited quantity, extra virgin olive oil of unique ultra low acidity ≈0.2%. Packed in fine tins for maximum protection and duration. In SPARTA GROVES which in reality is a vast forest of olive trees, there is an olive oil so rare and so secret! It's what the producers so far kept only for their own consumption. Named Early olive oil - not mature, in Greek. This secret is our green gold, the first green olive oil that we collect and bottle early. We call it FIRST GREEN GOLD. 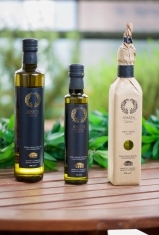 First Green Gold is our early harvest and first Extra Virgin Olive Oil produced every season. Our organic Extra Virgin Olive Oil is produced with care, made from the finest and most precious olives of organic farming, cold pressed. Elevates quality to highest level. When elsewhere the usual oil yield per tree is approximately ten liters, in SPARTA GROVES our olive trees yield only three to five liters of olive oil. This gives a rich taste while our organic farming reflects our responsibility to the enviroment. 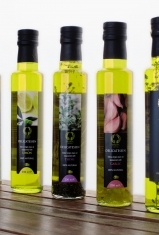 Gourmet extra virgin olive oils, aromatised with various natural fruit extracts such Lime, Wasabi, Chilly, or Pesto, are ideal for healthy use in your cooking, salads or dips. Packed in glass bottles of 250ml. Exceptional extra virgin olive oil seasoned with natural hand picked herbes such as oregano, thyme, garlic and natural lemon juice. Ideal for your cooking or grilling fish or meat dishes, salads or dips. Packed in white glass bottles of 250ml. 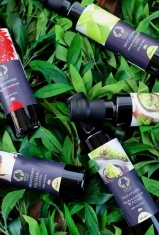 Gourmet exceptional extra virgin olive oils favored with various natural fruit extracts such as Blood Orange, Truffle, Basil and Chocolate. Robust flavors that wil fascinate your sense of taste with their extremely rich aromas and taste. Ideal for healthy use in cooking, grilling, salads or dips, used also in Ice creams!!! Packed in fine tins of 250ml.